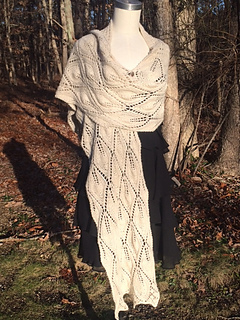 This stunning shawl features a center counterpane square which is knit from the center out. Instructions include directions for a “belly button” cast on for this. Stitches are picked up on either side of the square and knit to the edges. Requires 4 skeins of yarn; 3 skeins if you omit center counterpane panel. Directions are both written and charted. 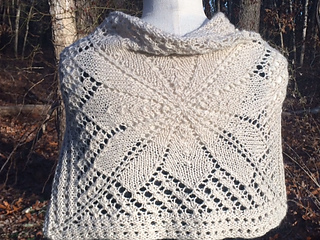 All Long Island Livestock patterns are free with the purchase of the yarn to make them. LI Livestock yarn is sold at yarn shows such as Vogue Knitting Live, and is occasionally available on our website lilivestockco.com. Sign up for our newsletter to keep up to date on the shows we are attending and the website updates. You can also call us and we are happy to send pictures of our current stock.